This weekend was spent largely on weeding out the vegetable beds, but there was a bit of time for planting out of peas and broad beans. We planted out some 35 pot grown broad beans. Our previous 15 plants will be bearing a crop soon – they are covered with flowers and some small pods. 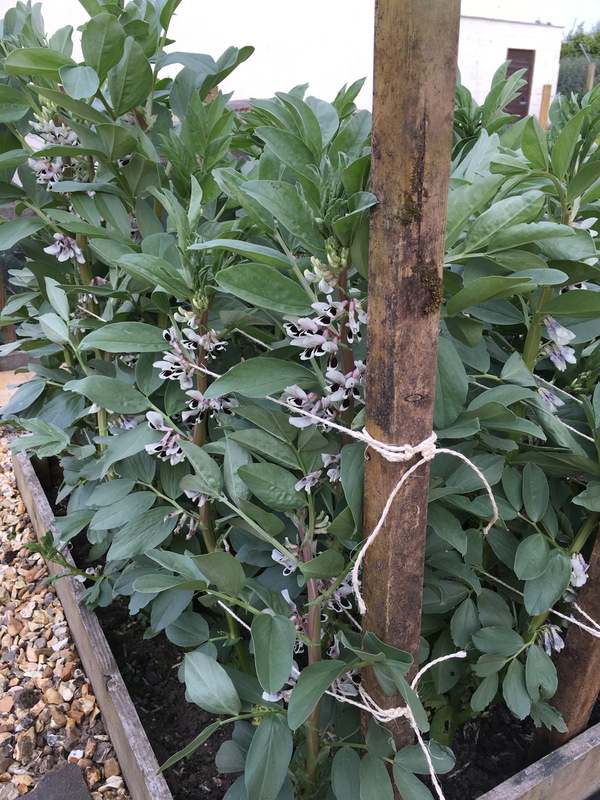 Broad beans are fairly sturdy plants, but when they reach their full height and start to bear they can benefit from some support. This is readily provided by stakes at the end of their four foot rows around which loops of strong string are tied. Individual plants are not tied in, but the string prevents the plants from being blown over or falling out of their row. Within the row it is enough for the plants to lean on each other for support. Such support is quick and easy to provide, although it helps to have a second pair of hands available to hold the plants in place whilst the strings are secured. Whilst tying up, we noticed a few leaves showing the tell-tale signs of chocolate spot. 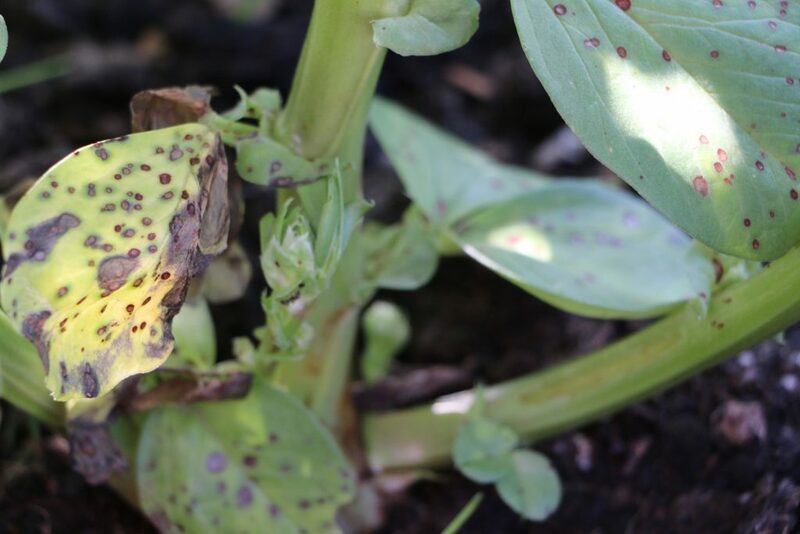 This is a common fungal disease of broad beans, caused by Botrytis fabae, and readily identified by the brown spots that form on the leaves. We tend to see some chocolate spot each season, but most often a minor infection that does not spread too widely and causes few problems. It can, though, spread rapidly in wet conditions, causing flower loss and even collapse of the stems. Badly affected foliage can be removed, but is best excluded from the compost heap. The disease can remain in the soil and in plant debris, hence good hygiene and crop rotation may be helpful. It can also remain in infected seed, which is worth considering if saving seed for the following season. This entry was posted in Garden diary and tagged broad beans, chocolate spot on June 1, 2016 by JV.